Blacksnake takes matters into his own hands. The air was cold and sharp. It nearly cut Blacksnake's lungs as he breathed it in; the fur drawn close to his mouth and nose to warm the air had become damp from his breath. He'd been sitting here too long, waiting. Even though the first light of the sun was lighting the skies to the east and most of the rest of the tribe was going to sleep, he refused to go into his den. 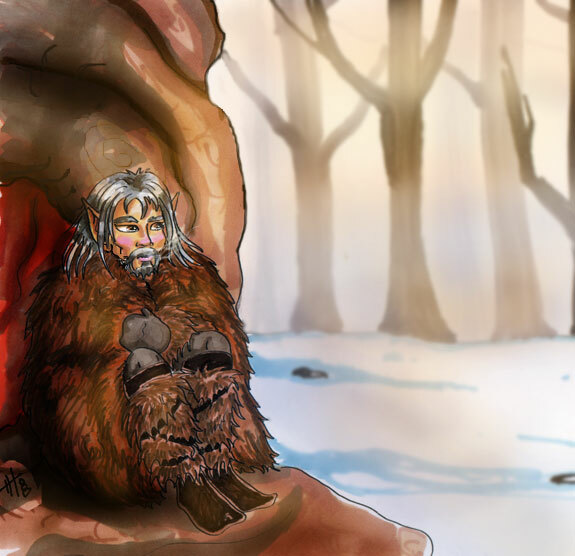 His warm, comfortable den. He glanced at the ground below that was bathed in the orangish sheen of the early new day. No, he would not retreat, despite the cold. He knew she would be coming soon, sneaking past like a wolf on the prowl so no one would see her, then going off to who knows where. Windsong's words echoed in his mind. She�d been quick to come to her niece�s defense during the impromptu council that had formed after the Howl for Willow�s wolf-friend, Grizzle. More than one pair of watchful, worried eyes had seen cause for alarm in the girl�s behavior. She'd seemed... changed... since the incident with her brother, and few thought it seemed a change for the positive, despite what the discovery of her new-found powers meant for the future of the tribe. Low-voiced statements of concern had led to speculative suggestions � what to do now that the tribe truly had the new healer it had waited for for so long, how to handle her odd moods, how to help her. Windsong�s rare explosion had come in response to One-Leg voicing the opinion that perhaps they needed to push Willow a bit harder than they had been, to develop her powers. "I understand that it's hard for her. We can tell that from how she's been avoiding us. But...we have loved ones who need her," Dreamflight added. "They have been waiting, some for lifetimes, for another flesh-mender to heal them." She hesitated before continuing. "And... there are some of us who are waiting for the same thing. She should know that and try to become ready for that." True Edge nodded. "We have to be better at protecting her, too. How many moons had she been hiding this from us and wandering off alone for whole days at a time? High Ones, she and Pathmark were taken by surprise by that she-bear! Who's to say something else won't do the same? We need to keep her close." "She doesn't want to be kept close. Would you want to be unable to go out and do the things you like to do?" Kestrel barked, uncharacteristically. There was a wounded look in her eyes. "She's not herself. She snapped at me when I tried to hold her the other day." Windburn had gazed evenly at the elder, taking in the troubled, almost frightened look on her face. �You�re thinking about Owl, aren�t you?� he asked, finally. The eyes of the others in the den followed his, waiting for the answer of the eldest in the tribe. Kestrel gave a short nod. "She's never snapped at me before. Ever� not even when she was a cubling. When she did the other day... I couldn't help but think of our last healer and his last days. I fear her stumbling onto that same path. I worry that if we push her, so soon, that we'll push her into madness, too. That we�ll be forced to� hurt her, or worse, just as Easysinger was forced to with Owl." Suddendusk had moved to Kestrel's side and patted her on the shoulder, trying to comfort the elder who was blinking back tears. "Sometimes, though, it's best to let something be rather than meddle with it. Some wounds are better left to heal on their own. The tribe can support, without pushing, letting people find their own paths. No one pushed me, when I lost my eye. Nobody pushed you when you lost your leg, either,� he reminded his older brother, who scowled back, unconvinced. �They let us figure out when to start pushing ourselves. Besides, what is the rush, really?� he concluded, spreading a hand. �Those who are sleeping have done so for years. They're safe for now and will be so until Willow is ready to tend to them." "She won't be going near Brightwood's cocoon until I'm sure she's ready," Farscout said, with grim conviction. �She just needs time,� Windsong quietly said. She, too, had moved to Kestrel's side. Windburn nodded. "Then we will give her time." Now, with the cold eating into him, Blacksnake sighed in frustration. That meeting had taken place a month ago, and still there were no signs of any change in their new healer�s mood. If anything, it seemed as if she had grown worse � more distant, not less. Distracted. The dark circles under her eyes said plainly that she was not sleeping well; all the tribe knew that she refused the company of her usual furmates. She might be thinner, though it was hard to tell under her White-cold clothing. When was the last time she had joined them in a feast after a hunt? Blacksnake couldn't remember. No, leaving Willow alone wasn't working. Something had to be done about this situation and done soon. The snow below, coated with a fresh crust of ice, crunched sharply. Willow passed below with scarce a look upward as she made her way out of the Holt proper and into the surrounding forest. When Blacksnake was sure she was out of sight, he descended and silently followed. She welcomed the early morning. Willow had come to mark it as the time that would be furthest from her return. It was a time of reprieve. As she put further distance between herself and the Holt, the dread that clutched at her insides became lighter, more bearable. If she tried hard enough to push it from her mind, she could almost make it go away. Almost, but not quite. She was broken. There could be no other explanation for it. Something had happened to her the night she brought her brother back from the edge of death. She'd pushed herself too far; she'd broken some kind of... dam inside that had kept those weird sensations she'd felt when she touched someone somewhat at bay. Now they wouldn't shut off. Broken. Unable to live normally even if she tried. She couldn't touch anyone, couldn't have anyone touch her, or those sensations � those awful, gut-wrenching feelings of moving into someone else's skin � would consume her and threaten to drown what little sense of self she had remaining. Broken. So broken that she'd hurt someone with a touch just to push them away... just so they wouldn't touch her and make those sensations surface again. Never mind that she had growled, no - snapped, at her own grandmother when she tried to help. Forget that she had turned cold shoulders to her friends, family, and tribemates time and time again over the past weeks when they tried to be encouraging of her newfound powers and of her. She couldn't tell them why she wanted them to leave her alone. They didn't know what this was like. Most of them had never even known a healer, let alone know what one must have to endure to master their abilities! How could they even understand what she was going through or even have any idea of how to help? And Willow had hurt Evervale! She still remembered the look on Evervale's face when she willed searing pain into the plantshaper's fingertips. Even this day, over a whole moon later, regret and guilt ate at Willow over what she had done that morning by the river. She knew only madness could make one elf deliberately hurt another. Owl had been mad. How many times had she heard, or even told, the story about how the last healer had used his powers to hurt the tribe and how Chieftess Easysinger had been forced to take his life to protect the others? And now she, Willow, had crossed that same line. She had willingly hurt someone. Evervale hadn't told anyone as far as Willow knew, but her silence wasn't the issue. The issue was that she was broken, mad -- just like Owl. Who knew when she'd lash out again just to make those awful out-of-body sensations stop? Would she kill or maim an elf next when they tried to hug or to hold her? Would Windburn be waiting with a dagger for her heart when the inevitable happened again? She'd had no choice, for her sake and for everyone else's, to stay away from others as much as possible. That was the only way she'd be able to hold on to what ever threads of self she had left. That was the only way the rest of the tribe could be safe. It was easier to change her own habits rather than change what others did. She hadn't realized how easy it would be. It was easy to tell others that it was better to go and check and re-set traps during the early morning. And it was easy to find ways to stay away from the Holt during the day so she could come home and sleep while everyone else was awake. The others started leaving her alone soon after she started to do that, it seemed, and she was happy about it... to a certain extent. It didn't ease her loneliness or the yearning she had just to be able to simply touch someone without losing that last bit of herself, but it made the dread go away.... At least until she knew it was getting late and it would be time to head back to the Holt. But that time was not now, she reminded herself. The sun was just rising. Right now she had time. Willow shivered. Despite the fact she was bundled in her winter clothing, she was cold. The hot-springs suddenly seemed very inviting. Without a thought, she changed direction and headed toward the welcome warmth of the nearer spring. The traps could wait until she wasn't cold any more. As she walked, she hoped beyond hope, that soon, somehow, she'd figure out some way to make those awful sensations stop before they consumed her. ...Except she really didn't have any hope left. Moving was better than sitting still. Blacksnake couldn't remember the last time the prey he'd stalked had been one of his own tribemates, outside of games of taal. Trailing Willow was proving no challenge, though. He knew he wasn't the best in the tribe at this kind of careful, silent stalking, but he was good enough at it -- and what helped him was that Willow didn't seem to be looking for anyone on her tail. That surprised him. She had become so secretive, so remote and careful; how had she not become cautious, and suspicious, along with it? Maybe she knew of the chief's orders to leave her alone? Blacksnake didn't know if anyone had told her of it. But if she did, that might explain why she seemed to take for granted that nobody would be following her. They�d debated that too, early on � almost as soon as the chief�s order had been spoken. Some had wanted to trail her, to keep watch over her from afar � much as Snowfall and True Edge had when their daughter had tried to run away from Recognition that past spring. True Edge had favored doing that again. They didn�t need to make it obvious that her tribemates were following her, he�d argued. But others had spoken up loudly against that, including his own lifemate. Willow wasn�t ill, and wasn�t insane, Snowfall had pointed out. She had a right to go where she pleased, within the safe confines of the thornwall at least. It would be insulting if they set someone to trail her, as if she were a cub. And how would she react if she discovered them doing it? It wouldn�t do her any good if she thought the tribe didn�t trust her. So the chief had included that in his decree, swayed by their counsel. And in those early days, Blacksnake himself had been unsure, and thus willing to follow the chief�s orders on the matter without protest. His brother One-Leg hadn�t been pleased with him; he still grumbled that letting the girl-cub work things out on her own was no way to help her learn to use her emerging powers. Blacksnake acknowledged the right of that, too. That had been the problem � there was merit in each of the courses that his tribemates strongly recommended. Giving her time, not making her feel pressured � that seemed like a wise idea. It respected her, and it was true that they had time. Or at least, they hoped they did, Blacksnake thought darkly. He was well aware that there were two hunters alive now, Farscout and Pathmark, who very likely would not have survived had Willow�s powers not started to emerge when they did. He was more relieved than he could express, more grateful to her for saving them than he knew how to show � even if she would have accepted it. He also knew there was no guarantee that those healing powers would not be needed again soon. Yes, the sleepers in their Preserver cocoons had time to let her learn her powers. The other members of the tribe might not be so lucky. But was One-Leg�s suggested course of action any better? The elder was quick to point out that nobody ever learned to swim by staying out of the water � and that was what Willow seemed to be doing with the time and space that the tribe was giving her. As far as Blacksnake could tell, she wasn�t coming to terms with her powers � she was avoiding them, just as, increasingly, she was avoiding the rest of the tribe. Blacksnake paused when Willow did, one hand on the tree that would hide him from her if she chose to look in this direction. She didn�t. She still wasn�t trying to avoid being tracked, and her trail was childishly easy to follow in the snow. She was heading south, and he wondered how far she intended to go. The sun was rising and the day advancing, but she showed no signs of stopping. She surely wasn�t pausing to check her trap-lines, either, as she would have had others believe. Blacksnake sometimes found his older brother�s blunt and hearty manner useful; he wasn�t one to shy away from pressing an issue, himself. The old memories of Owl�s last days that had been brought to the surface by recent events had made him feel more hesitant, more cautious than One-Leg � but he was starting to feel a greater sympathy towards the other�s viewpoint. As for True Edge � he was still voicing his opinion that leaving her alone was being too careless with the girl; that she was more important now than anyone else in the tribe, and they needed to treat her that way, whether she felt hemmed in by it or no. It was hard to disagree completely. Willow was important now, in a way she had never expected to be. Like it or not � and he bet she didn�t � her life wasn�t truly her own any longer. Blacksnake had already guessed that she would hate that conclusion � Finch and Bowflight's oldest cub had always struck him as feckless. She pulled her weight, but she'd never liked responsibility, from what he'd seen, and he thought she took pleasure from having a wild reputation. High Ones � of all the people to have received this gift...! Maybe the other younger members of the tribe sympathized with what a burden it could be. That was a mark of the gulf that existed between those who could remember what having a living healer was like, and those who could not. Blacksnake knew he could not be the only one of the elders who would have accepted such a gift with open arms � accepted the responsibility, the duty they would owe to the tribe, and the status that would come with it. Frankly, Blacksnake was surprised that True Edge�s counsel hadn�t held greater sway with their chief. Windburn had always been close to the blond hunter; their way of looking at the world, their way of attacking life had always been similar. Blacksnake himself had assumed that Windburn�s impulse would be some mixture of what True Edge and One-Leg were proposing � it fit with what he knew of his chief-son�s inclinations. Apparently the cub could still surprise him, he thought wryly. That, or Windburn was truly learning, as he aged, to second-guess his first impulses. Or perhaps it was only that the chief had decided to give the most weight to the wishes of those who were Willow�s closest family, Kestrel and Windsong. Yes, Blacksnake decided, that was like his son � to be influenced by his gut�s sympathy with the strength of their concern, rather than to weigh all of the competing factors. It took strength to deny those who strongly argued differently, though � Blacksnake had to give him that. Well, he had followed his chief�s orders, and waited. But he�d watched as well, and he didn�t like what he was seeing. Something had to be done, chief�s orders or no. Not that others hadn�t tried already, themselves. Windburn had ordered that they not push Willow about her powers; the chief didn�t want her badgered, but he hadn�t forbidden all attempts to offer help or comfort. Blacksnake knew that Cloudfern and Starskimmer both had tried to talk to her, as fellow magic-users � but by their reports, they hadn�t gotten past pleasantries, and then Willow had made her excuses and hared off. One-Leg had taken to joking that maybe it was time she took a new tribe-name � �Rabbit�. But it was no joke, seeing that look of fear in a tribemate�s eyes as she bolted away from those who loved her and wanted to help her. Rainpace�s patient offers she�d rejected time and again. She�d refused Chicory�s suggestion to accompany her in checking her traplines; Dreamflight�s invitation to go ice-fishing; Foxtail�s attempt to divert her with a trip to the hot-springs with the rest of them. No matter how careful her friends were to respect her boundaries, it seemed that Willow wanted no more to do with them than she did with her brother or grandmother or aunt. And within the bounds of Windburn�s orders, there was little that any of them could do, if she wouldn�t even meet them halfway. Predictably, it had been Notch who�d first defied his chief. Notch had never been known for his patience, except when playing a carefully-planned prank. Naturally, he�d tried to trick his way around the personal thornwall that Willow had thrown up to keep all others at bay � around it, or through it, whatever worked. He hadn�t trailed her, but had somehow managed to place himself along her traplines nonetheless, there ahead of her, waiting for her or leaving gifts in his place. And finally he�d hidden himself in her den, in the furs piled high in the central bowl of her bed, waiting for her return. He�d surprised her, all right, and for those there to witness it, it had been good to hear Willow yelling at him with much of her old volume and level of invective. But it hadn�t gotten Notch anywhere, except tossed out naked into the snow � and soon after that, hauled in front of his chief for a second round of tongue-lashing. Windburn had left no one in the tribe in any doubt � despite Notch�s protests that he hadn�t even mentioned her powers, he didn�t care about her dung-rotted powers � badgering was badgering, and when the chief said to leave her be, by Halfwolf�s mane, he meant leave her be. It was a lesson that the entire tribe understood clearly � and Notch�s continued tuck-tailed performance of his punishment duties of helping his sire mend nets for the coming fishing season served as an instructive reminder. For once, Blacksnake had to concede that he admired his son�s decisive action� even if he�d come to disagree with the policy it was serving. Not that he agreed with Notch�s methods; hardly that! But in the two hands of days since that incident, Blacksnake had continued his watching and waiting, as had everyone else. No one was any closer to coaxing a response from the new healer � not Snowfall, with her careful, gentle probing; not Windsong or Pathmark; not even Kestrel. Willow had become more sly and secretive than ever, barely seen around the Holt. No � Notch�s foolish plan had been the wrong way to go about it, and in fact it had driven her further away, until she barely seemed a part of the tribe any longer. And that could not be allowed to go on. Maybe others saw that, too. He�d heard other grumblings, been there for more worried conversations. But Notch�s defiance hadn�t helped in another way: it made it less likely that Windburn would allow himself to be talked into changing his orders any time soon. The chief�s hackles were up, and he was in no mood to be argued with � he�d even snapped at True Edge�s renewed suggestion of setting a watch on Willow. Blacksnake knew that arguing with his son once he was set on a course of action was a thankless task at the best of times. Even if someone wanted to propose a different plan, they�d have to brave the chief�s foul mood to do it. Blacksnake was plenty brave enough for that � but smart enough, too, to know it would do little good. If Windburn wouldn�t listen to his closest friends and advisors, then the chance was slim that he would listen to his father, either. Perhaps Kestrel or Windsong, if they were worried enough, could turn him from the course that they themselves had suggested. Blacksnake didn�t know how close they might be to the conclusion he�d come to on his own. That left one other course open � outright defiance of his son. If few were likely to argue with Windburn, in the mood he was in, then fewer still would want to brave the wrath he�d lately visited on Notch. More than that, defiance of a chief was something that most wolfriders never contemplated. For all his troubled relationship with his son, it wasn�t a thing that Blacksnake considered lightly, either. He�d known himself in the wrong, when he�d shared Farscout�s secret and chose not to tell the chief. By rights, Windburn should have handed him his head for that � and hadn�t, yet. Easysinger would have. But then, Blacksnake would never have kept such a secret from Easysinger. That, Windburn likely knew. What the chief apparently did not know was how to handle such a betrayal by his father. Where Easysinger would not have hesitated, Windburn had turned aside, choosing to leave it be. It made it easier now to take this course. Whatever Windburn�s response would be to this second act of rebellion, Blacksnake would handle that when the time came. By now the sun was well up, offering weak light in a hazy sky. Willow had been following a well-worn path that was taking her to the nearer hot-springs � a welcome prospect on this frosty day. There was always the chance of catching prey drawn there by the warmth of the springs� steam; but, always the danger, too, of running into another predator with the same idea in winter�s lean times. Bears might be asleep for the white-cold season, but tuftcats, mountain cats, and stink-bears were all known to visit the hot-springs. Blacksnake hoped, if Willow had been coming here regularly on her own, that she�d remembered that. Nothing terrible had happened yet, but that didn�t mean it wouldn�t. And that, in the end, was what had driven Blacksnake to action. Yes, they were elves, and their lives could be long. The seasons passed in the blur of the Now, one year was very like the one before it, and the one before that. But they were also wolfriders, and it was a fool who didn�t remember that life was also dangerous, and could be cut off in a moment. They all knew that. Willow especially must know it � she would have learned it anew when she�d healed her brother of the bear�s attack. Such a fate could strike any of them, old or young, experienced or not. But now, in Willow, they had hope again, for the first time in nearly Blacksnake�s entire life. That was why they could not lose her. And that was why he could not leave her on her own, to work through her doubts and fears; couldn�t watch her indecision and carelessness, and not act. Any other magic-user, perhaps, but not a healer. Ahead, he could see the heavy frost covering all of the bushes and the trees, deposited by the steam of the springs. It would be underfoot as well, and his steps slowed and became more careful, not wanting to alert Willow yet to her follower. It would be time to reveal himself soon, though. Out here, just the two of them � no other tribemates to interfere or hide behind. Willow had been left alone long enough. It was time to remind her of her importance � and that she wasn�t the only one affected by this matter.